The first part of the 2016-2017 year is coming to an end very quickly, and it has been both an exciting and busy semester. Our District has almost completed our first semester with just 3 short weeks left, and I’m looking forward to what is ahead of us. As we reflect on the many things for which we are thankful, I want to take this opportunity to share just a few of them with you: We are thankful for our students who come to school every day ready to learn…they give us all a daily reminder of what is important and why we are here. We are thankful for the support of our community and parents in creating an outstanding partnership for our students. We are thankful for the teachers, instructional aides, bus drivers, office staff, nurses, food service, support staff, maintenance and custodial teams and administrators who really care about student achievement and have the best interests of our students at heart. We are also thankful for our volunteers who enthusiastically contribute so much to our District. In these most difficult and challenging times, we see dedicated and tireless individuals going above and beyond to make sure that great things happen in our District. They do make a difference, and the children, in their own individual ways, benefit from those efforts. Most importantly, we are thankful for our community and parents that have kept their faith in us. They continue to share their most valuable possession with us and—in most cases— work hard and advocate to be a partner in their children’s education, safety and well-being. For this, we are ever so thankful. 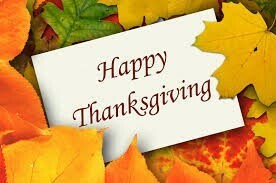 I would like to wish all of you and your families a happy, healthy and relaxing Thanksgiving holiday! The Thanksgiving Holidays will be Nov. 21-25 and classes will resume on Nov. 28th.